Come down to the Ravenswood Estate for a very special event in the Stow-Lab series. 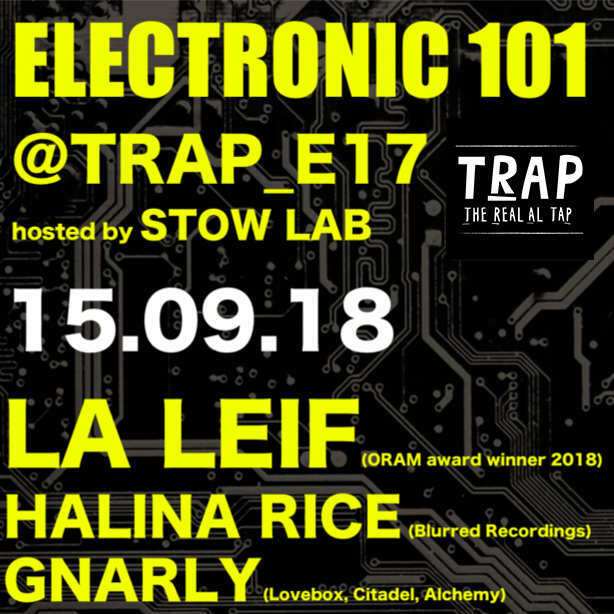 From 2pm at TRAP Stow-Lab hosts a live improvised electronic music jam, followed by a programme profiling rising stars of the electronic music scene. For this line-up we’re focusing on female talent and we’re excited to have one of the winners of the ORAM award, recognising female music innovators, as our headline act. We are hugely honoured to have Francine Perry (aka La Leif) play this event. Recently awarded the ORAM award recognising emerging artists La Leif plays a fully analogue live set on a mixture of samplers, synths and drum machines. Her Violet EP is launched September 4th . For this special set she will be accompanied by live instrumentalists. Halina is a producer and live AV artist whose debut album REDUX was released on Blurred Recordings, described by Clash Magazine as ‘a world of fragmentary beauty’ and Fame Magazine as ‘a credible and exciting avant-electronic pearl’. Her AV set includes visuals by award-winning VJ Mowgli. Gnarly is a rising London based Producer and DJ creating genre-bending future beats. Drawing influences from jazz, funk, hip hop, r’n’b and neo-soul. A multi-instumentatlist, she has attracted a lot of interest online with her live finger drumming videos reaching viewers all over the world. We’re thrilled that Eve will be with us to compere the evening – as well as having a career as a successful artist signed to major labels she also set up a recording studio for under-privileged and young people whilst supporting female producers and sound engineers. Eve has hosted multiple music events and workshops and is a core member of the Native Instruments Meetup team. Expect Ambient, Dub, Experimental, Techno, Electro, Bass and more all on a top notch DnB Audio Soundsystem.